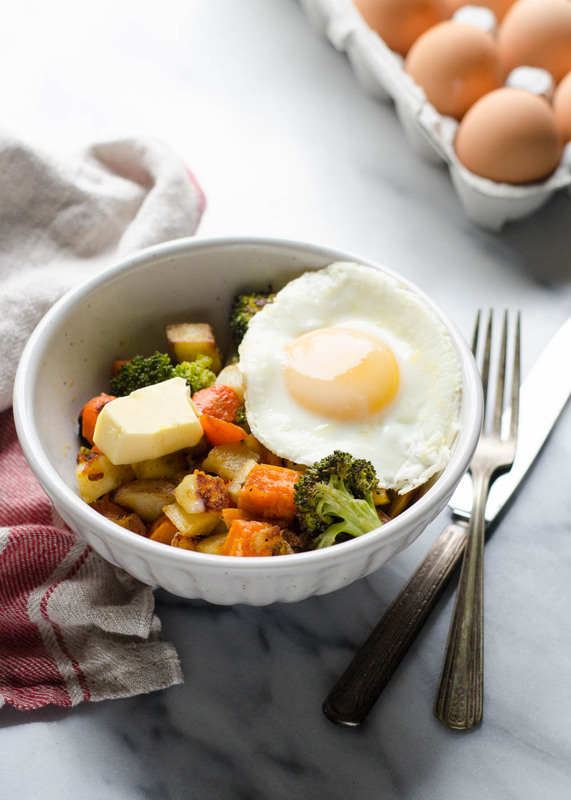 These roasted veggie breakfast bowls are Paleo and Whole30 friendly. 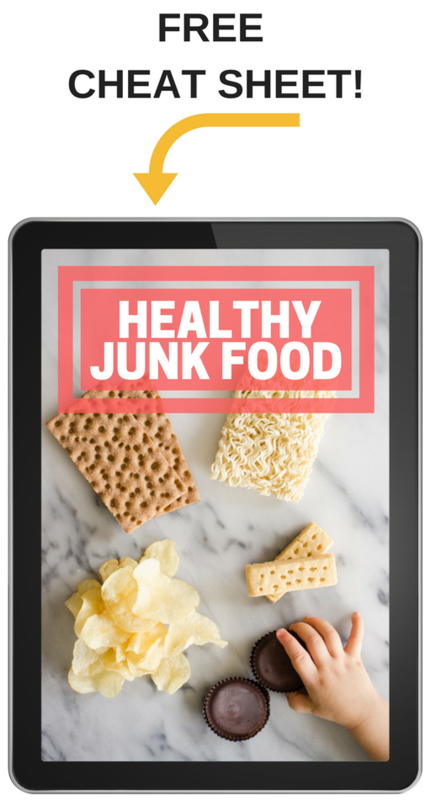 They’re a delicious and healthy way to start your day! You guys, my baby girl has started school! I mean, it’s only preschool, but still: !!! Having been homeschooled myself, I have always known that I wanted to homeschool my children as well. I loved the experience! I have really been enjoying teaching Helen. Of course we have our moments of struggle, but overall it’s been great so far. Helen is upset if we have to skip a day for some reason. I’ve been doing it 5 days a week – many preschools only run 2-3 days a week, so I feel like this gives us some flexibility. We won’t get behind if I get sick or something and can’t teach for a day or two. I’m planning on doing a more in-depth post about the process over on my personal blog, so stay tuned for that if you’re interested. Starting school has definitely made my days busier. I really have to cram things in since I try my hardest not to do my computer work while James is awake. So having breakfast sorted beforehand is a life saver some mornings. I personally love a slow start to the morning, but the kids demand food almost as soon as their eyes open. 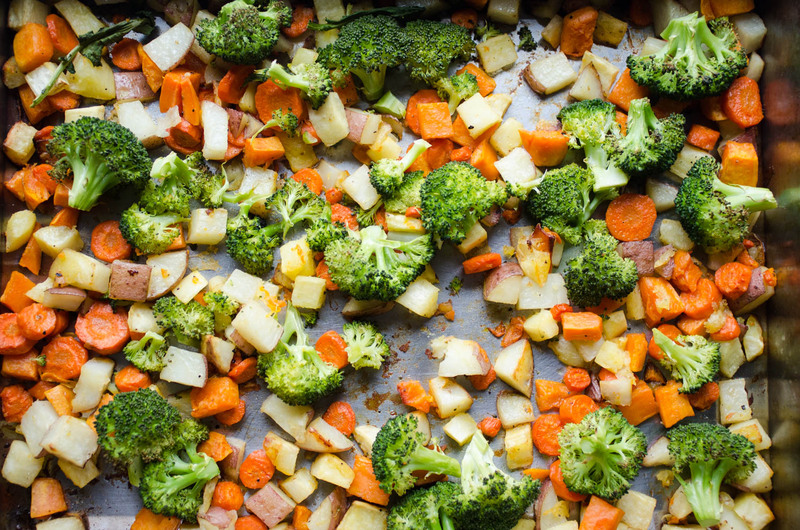 By roasting up a big batch of veggies, I can have a quick, nutritious, and satisfying breakfast ready for a couple of days. Hallelujah! 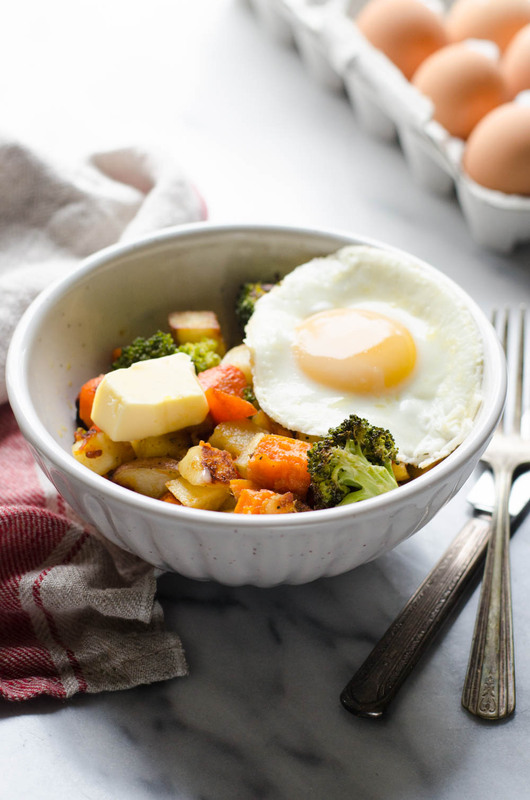 These roasted veggie breakfast bowls have been a life saver! You can certainly use whatever veggies you prefer, but I like to include a good amount of starchy ones for the kids. Here I used red potatoes, orange and Japanese sweet potatoes, carrots, and broccoli (it’s one of the few green vegetables that Jim will eat). I think things like Brussels sprouts, mushrooms, and garlic would be lovely as well. 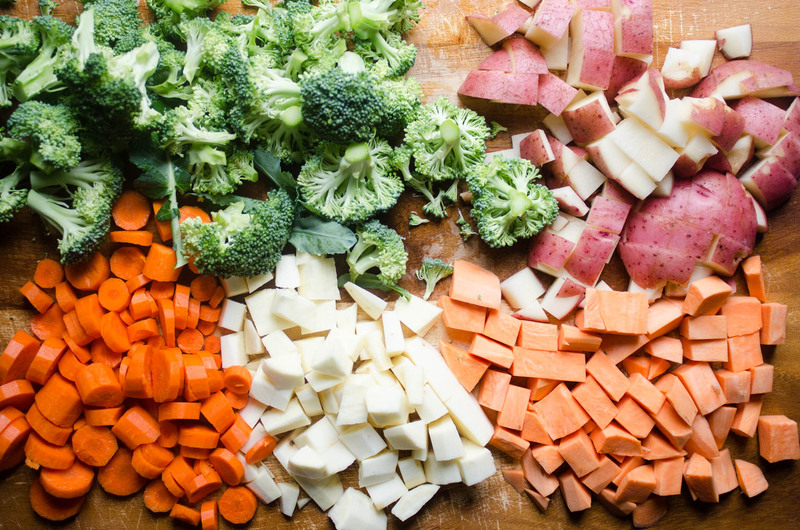 The one thing you need to keep in mind is that not all veggies cook at the same rate. In this instance everything but the broccoli got soft in a similar time frame. I just made sure to give the potatoes and carrots a 35 minute head start. If you like your broccoli very soft and charred, you could go ahead and throw it in at the start. But I prefer mine with a slight bit of crunch left in them. 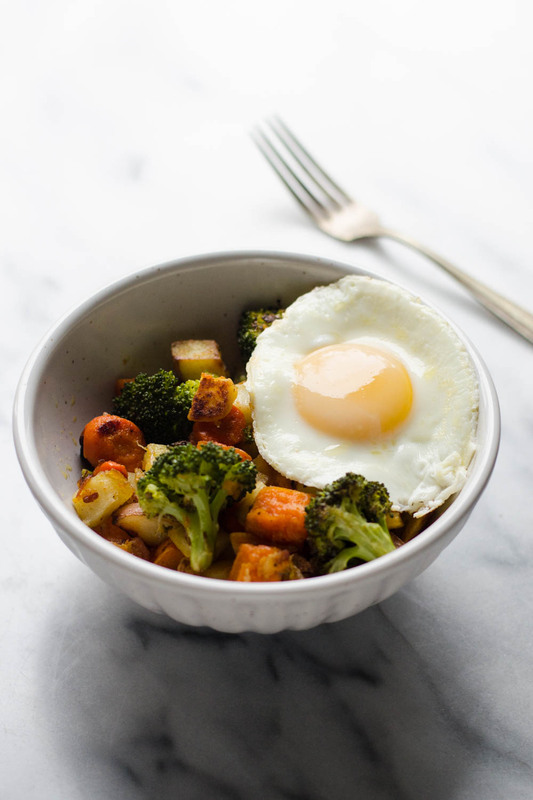 The next morning, all that’s left to do is re-heat the veggies in a skillet with a bit of butter or avocado oil, fry an egg in the same pan, and devour! 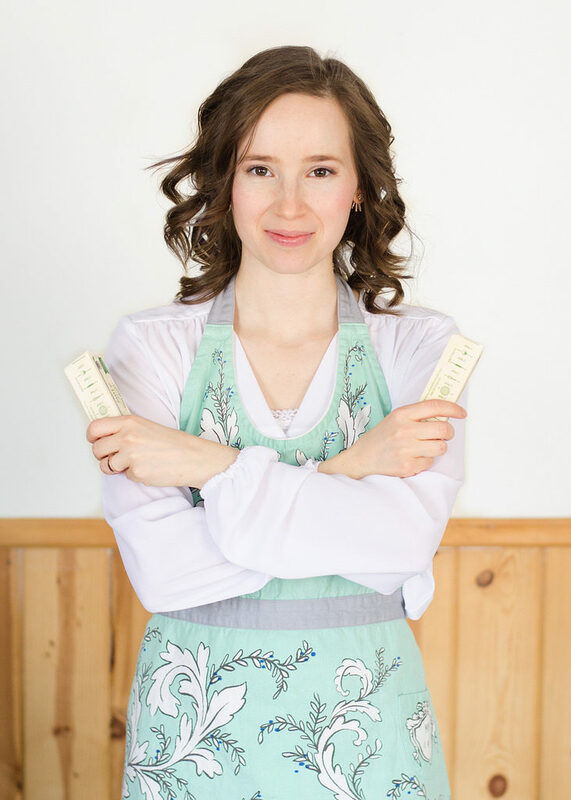 I personally love to serve mine with grass-fed butter, but if you’re Paleo or trying out Whole30 you could substitute coconut oil or even beef tallow or chicken fat. You could also serve this with a side of bacon or sausage if you need more protein. How about you? Do you like a nice slow start to the morning, or do you like to get things going as soon as your feet hit the floor? With a bit of meal prep, these healthy and comforting breakfast bowls will come together in a flash in the morning. 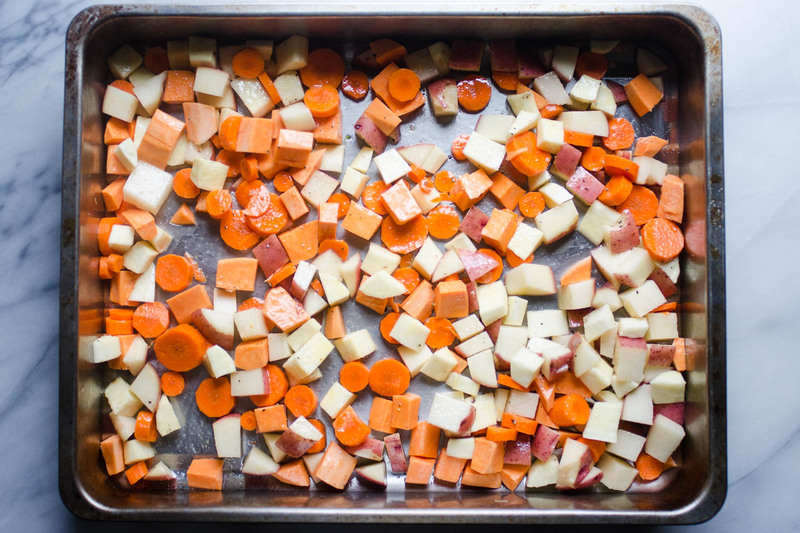 Place the potatoes and carrots in a large roasting pan. Sprinkle with salt and pepper to taste and drizzle with avocado oil. Stir well to evenly distribute the oil and seasonings. Roast in preheated oven for 35 minutes, stirring now and then. Add the broccoli and roast for an additional 15-20 minutes, or until tender-crisp. Allow to cool and store in glass containers in the refrigerator until ready to serve. In the morning, heat a cast iron skillet over medium heat and melt some butter. Add the amount of the roasted veggies that you plan to eat and saute until nice and hot. Fry an egg or two in the same pan. Serve hot with butter or coconut oil. « 10 Recipes for National Pumpkin Spice Day! This is the ultimate dream breakfast for anyone who is trying to live healthy, I am so excited to see this recipe. Thank you so much! Thanks for a simple but brilliant recipe! 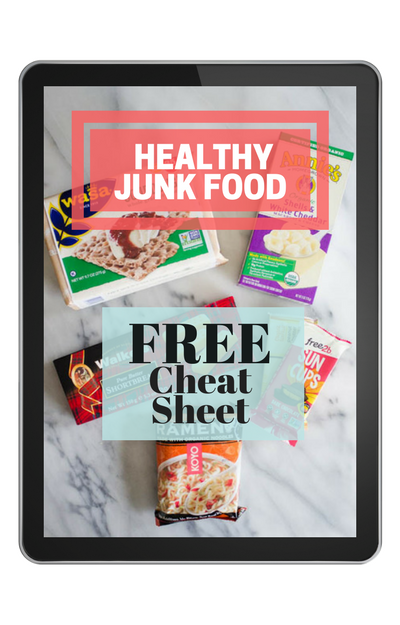 I am taking over cooking duties in three weeks so my wife can focus more on homeschooling our five kids . . .really looking forward to trying this. 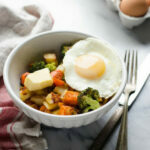 Might roast the potatoes, then add a big bag of frozen stir-fry veggies for convenience. Duck eggs from the coop to complete the meal.